Webpage created: February 05, 2016. HMS "Doris" Gun and a Devonport Police Constable. This unusual monument in Devonport "People's Park", which has a Grade II listing from English Heritage, was unveiled on Saturday February 27th 1904 by Admiral Sir Edward H Seymour GCB OM, Commander-in-Chief at Devonport, and Vice Admiral Sir Robert H Harris, whose flag was flying on HMS "Doris" at the time of the action it commemorates. The gun was handed over to Devonport Corporation on the same day. The polished granite plinth was the work of Mr Harry Hems. HMS "Doris" seems to have been involved in at least two incidents during the Boer War in which the crew combined with the Royal Marine Light Infantry (RMLI) to form a Naval Brigade in order to fight ashore. The first was at the Battle of Graspan on November 25th 1899, when Commander Alfred Peel Ethelston, RN, of HMS "Powerful", and Major John Hulke Plumbe, of the RMLI attached to HMS "Doris", were killed in action. The second incident took place the following year. The British, under the command of General Sir Forestier-Walker, had surrounded the Boers at Paardeberg. With Ladysmith and Mafeking still besieged by the Boers and Kimberley only relieved the previous day, February 16th, the General realised that to take Paardeberg would be of vital importance to the British. He sent an urgent signal to the Commander-in-Chief of the Navy's Cape Command, Vice Admiral Sir Robert Harris, asking for as much support as the C-in-C could provide. Without any hesitation, the Vice Admiral formed a Naval Brigade using every spare rating and officer he had and these were sent the 800 miles or so over land to the battle front, led by Commander William Lowther Grant. Alongside them were 200 members of the Royal Marine Light Infantry with two 4.7 inch guns. The Boers under General Cronje duly surrendered on Tuesday February 27th 1900 and the sieges of Ladysmith and Mafeking were lifted on March 1st and May 17th respectively. They subsequently assisted in the capture of Johannesburg and Pretoria. The crew of HMS "Doris" returned to Devonport on October 7th with the prize of one of the Boer's pom-pom guns. 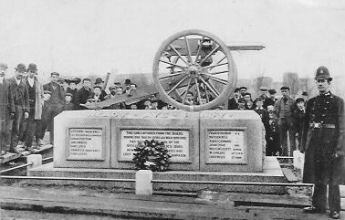 In honour of their colleagues killed in that action, the men subscribed to have the gun mounted on its Dartmoor granite plinth and placed in Devonport Park. In January 2007 work started on a restoration project which saw the gun removed and transported to the premises of Messrs Andy Mitchell Sculptures in Gloucestershire. During the work some bullets were discovered jammed inside the gun barrel. While it was away, the stone base was cleaned and cracks in the tablet listing the names of the men who gave their lives were repaired. The work was paid for by a grant of £75,000 made by the Devonport Regeneration Community Partnership, which also helped to restore the Devonport War Memorial to its former glory. The gun is now back in place.